leela | Randomwhoness: a Doctor Who blog by Johnny Spandrell. Sampling stories in random order. So the story goes that writer Robert Holmes got in a huff about paying his tax bill and, seeking revenge, wrote The Sun Makers as a barely disguised rant at the tax system. If true, this was a terrible idea and would surely have only ended up driving Holmes, a well-known hater of bureaucracy, spare. Because it must have lead to a particularly maddening type of recursion where writing a television show about how angry you are about your tax bill, results in you earning more money, on which you’ll need to pay more tax. It’s kind of like trying to get even at your hangover by having another drink. Some Doctor Who reference book (forgive my vagueness on this, I’ve read so many over the years and have now all but given them up) once said that this story makes the mistake of confusing government taxation with the profit making of a company, which it argued, are completely different things. I think this utterly misses the point of The Sun Makers, in which Holmes imagines a world in which government has taken on the trappings of capitalism so completely, as for the two to become intertwined. Given the state of governments around the world in 2018, this is surely not so unbelievable. It doesn’t seem much more of a leap to imagine that a company selling the very basics of life – sunlight, oxygen, water – would come to the conclusion that a far more efficient way of selling universal services, is to simply take the cost directly from each worker’s pay packet. As a way of making money, taxation is not a bad business model. But it doesn’t matter anyway, because for Holmes, the Company and its staff of blowhards, incompetents and sadistic creeps isn’t just a stand in for capitalism or government or even the BBC (complete with a revolving globe of Pluto and its six suns). It’s an amalgam of everything he hates; pointless bureaucracy, compassionless authority and unsanctioned environmental meddling. Wrapped up in one of his most fervent concerns: what are we going to do when the Earth can no longer sustain us? His answer, as always, is make all the same mistakes again. But with new scenery. The Sun Makers sits quietly in Season 15, not drawing attention to itself – but it’s a pivotal story. It marks a subtle change in the series where the creepy thrillers of Holmes’ era as script editor, give way to stories which are lighter in tone, but more narratively ambitious. For the first time in years – probably since Holmes’ own Carnival of Monsters – we have a story where naturalism is abandoned, real life is satirized and characters are exaggerated caricatures. It’s a Sylvester McCoy story ten years too early. This doesn’t feel like a story Holmes would have commissioned for one of his own seasons, but one that refreshes him, now he’s finally free from the pressure of having to make a whole series of the damn thing. What this liberation means in practice is that Holmes gets to write some of his wittiest dialogue and the cast eat it up. Tom Baker is still playing it quite seriously, but he’ll shortly change his approach to being more outlandishly comic. I think The Sun Makers plays a role in that. Douglas Adams is on record as saying that the problem with writing something funny, is that some actors feel they have the license to send up the material and add comic embellishments of their own (I wonder who he could have been speaking about?). It’s surely the change in tone in this story which Tom picks up on, and takes as a signal to start injecting more of his own humour into the show. Whether anyone asks him to or not. It’s not just that there’s more humour in the show than before, nor that it’s pointed towards uncommon targets. It’s more that The Sun Makers is showing a way to tell Doctor Who stories which had, up to that point been occasional, but which was about to become the norm. You can see its influence in the next two seasons where villains become larger than life, situations become more absurd and jokes start to set the rhythm of each episode. And like those subsequent seasons, there’s always a grim sentiment behind the jovial approach. In this episode, the flamboyant pooh-bah of the Company, Gatherer Hade (Richard Leech) is thrown off a building by the company’s revolting workers (even to the end, he’s in wide-eyed amazement at the insolence of this action). And the mole-like Collector (Henry Woolf), a pasty little sadist who likes listening to people being steamed alive, might come with a bag of one-liners, but is also only just prevented from poisoning the entire population with gas, like someone fumigating a house. Luckily, the Doctor is on hand to feed in a particularly tricky sum into his computer to trigger a lightning-fast global financial crisis. In panic, the Collector does what all companies do in their death throes and liquidates. That’s Holmes’ whole approach – the approach to this new way of doing Doctor Who – right there in that one villain’s demise. It’s gross, funny, highly stylised and self-referential all at the same time. The irony is that there’s another financial crisis impacting on The Sun Makers; the story’s budget restrictions are shockingly apparent. Corridors are made from shabby old flats. Prop guns are cardboardy. A number of sets, such as the Others’ lair, the Gatherer’s office and the steaming chamber, can’t afford walls, giving the show the air of being performed in a theatrical black box. It’s at this point in the series’ history when inflation is galloping (as it does in the story itself) and the lack of money really starts to show on screen. The next story, Underworld, has to be almost completely greenscreened. The story after, The Invasion of Time, makes villains out of aluminum foil. Faced with similar restrictions, other Doctor Who makers have limited the show’s scope to fit. Derrick Sherwin exiled the series to Earth. Andrew Cartmel set more stories in history. But just as the show’s new lighter tone doesn’t really stop it from being gruesome, the Graham Williams era’s budget restrictions don’t limit its ambitions. If anything, the show’s scope broadens – more space faring, more alien planets, the biggest monster ever out on screen. The show never looked cheaper, but it flatly refused to cut its suit to fit its increasingly expensive cloth. But when watching Tom Baker concoct a cliffhanger from within a wobbly shower cubicle, or tinker with a couple of pieces of plumbing junctions glued together in an approximation of a security camera, the theme of the story seems to intrude into its production: everything, it seems, comes back to money. Holmes might have enjoyed getting his own back at internal revenue, but I think the taxman would have had the last laugh. Every royalty cheque from every overseas screening must have brought with it the sharp reminder that some of that £2.39 he got from El Doctor Misterio – los Fabricantes de Sol screening in Nicaragua must go to the tax man. I bet the irony wasn’t lost on Holmes, as he filled out his tax return each year. “Praise the Company,” I like to think he muttered under his breath. LINK TO The King’s Demons: oddly enough, they both start with someone getting in trouble for not handing money over to the ruling class. NEXT TIME… It’s insane and it’s about to get even more insanerer. We’re off to meet The Rebel Flesh/The Almost People. There is much about British television from the 1970s which is concerned with class. It’s in The Good Life, where the greenies move next door to the toffs. It’s in George & Mildred, where the toffs move next door to the oiks. It’s in Fawlty Towers, where the toffs go on holiday with the great un-poshed in Torquay. And it’s the very basis of Upstairs Downstairs where they all live together under the same roof. It’s the stuff that happens, be it funny or tragic, when the haves and the have nots are forced to mix, which seemed to fascinate TV makers of the time. Doctor Who, being the kind of far out space fare that it is, generally bucks this trend. Until Horror of Fang Rock, when a boat full of the upper class crashes into an island of the working class. It’s the turn of the last century. Fang Rock is home to nothing but a lighthouse, and to no one but three men and some chatty seals. The three men Ben (Ralph Watson), Reuben (Colin Douglas) and Vince (John Abbott) are briny, hard working types, plain speaking in various regional accents. Ben doesn’t get out of the first episode alive; he’s quickly done for by the monster of the week. But the other two are on hand when a particularly flimsy looking yacht disintegrates on a model stage at Pebble Mill. Rescued from the doomed vessel are MP Skinsale (Alan Rowe), lordly Lord Palmerdale (Sean Caffrey) and his secretary Adelaide (Annette Woollett). They have few redeeming features. They arrive in the lighthouse in Part Two, soaking wet and full of complaints. As soon as he arrives, Palmerdale’s barking orders and demanding brandy. He’s a scoundrel through and through; desperate to get to London so he can make good on some shady deal. It was he, it turns out, who caused the boat to crash, as he was insisting it go faster in terrible weather. So says boatman, Harker (the very theatrically named Rio Fanning), the one member of the working class brought to Fang Rock by the ship, and it infuriates him so much he briefly tries to throttle Palmerdale. Class warfare in front of our eyes. Palmerdale’s also at odds with Skinsale, a kindly, older gentleman who seems like he might be the toffs’ one sympathetic voice. But then he goes and spoils it all by doing something stupid like wrecking the telegraph machine. This might seem an unreasonably reckless thing to do, when you’re in a lighthouse under siege by a murderous snotball, but he’s locked in a subplot with Palmerdale and is very keen to stop the little moneygrubber getting a message to London. The corrupting power of money is an underlying theme in this story. Palmerdale’s the epitome of it (he even tries to bribe our two working class heroes Vince and Harker) and when he dies, it’s the diamonds kept in his body belt that Skinsale dies scrabbling to collect. It’s tempting to conclude that it’s greed that leads all the characters on Fang Rock to their doom, but the alien blob in question, the electrifying Rutan, cares nothing for social class or human foibles. It sets out to kill all the humans on the island and that’s what it does, be they sympathetic or not. “Everybody dies, Leela! Just this once… everybody dies!’ we can imagine the Doctor (Tom Baker) saying and given the foul mood he’s in, I wouldn’t put it past him adding one of those enormous grins of his. Just to emphasise that although that Rutan might think it’s the scariest alien on the rock, it’s got nothing on the ol’ teeth and curls. Yes, Tom is cranky. He’s been dragged away from his favourite drinking holes around Television Centre to Birmingham. No-one’s listened to him when he’s requested that his new companion be a talking cabbage and so he’s stuck with scene stealing Leela (played with fortitude by Louise Jameson). He’s being directed by Paddy Russell, who’s taking none of his nonsense. The comfort of a few dozen pints and a cohort drinking companions to raconteur at seems as distant as Fang Rock is from Brighton Beach. Still, out of this funk comes something brilliant – a proto Capaldi. The popular image of the fourth doctor may be of a jolly, jokey fellow, but he’s nowhere to be seen on Fang Rock. If he smiles at all, it’s only to counterpoint some appalling turn of events. “Gentlemen, I’ve got news for you,” he announces at one point. “This lighthouse is under attack and by morning we might all be dead. Anyone interested?” he beams. Of course, he looks at none of his fellow actors, but here it seems less like the by-product a Baker tanty and more a deliberate ploy to make every interaction more awkward and unsettling. As the death count mounts, he barely displays any interest, let alone remorse for the lives being snuffed out. He’s as remote and as unfeeling as a lighthouse, save for the chilling realisation that he voices at the end of Part Three, when he tells Leela that he locked the creature they’re fighting inside, not out. This is the beginning of Season 15. Skip forward to the end of that season, to The Invasion of Time, and we see a very different fourth Doctor – one that gives jokey asides to camera, balances pot plants on his head and takes tips from the ministry of silly walks. The brooding loner of Fang Rock has been banished. Somewhere along the line, Tom decides to start having fun. But then by that stage, he’s back at Television Centre. Holding court. King Tom. Horror of Fang Rock is highly regarded these days but it wasn’t always. In fact, it used to be the marker stone between good Doctor Who and bad; it was the point where it all went wrong. I remember a very stern letter to Doctor Who Magazine back in the eighties, where some people declared “we are of the opinion of that the show has declined in quality from Horror of Fang Rock onwards”. Or something like that. I’m not about to rummage through my stacks of DWM to find the exact quote. I think what they meant was that this was the point where everyone started having too much fun (and as I said about The Androids of Tara, that’s a dangerous thing). If that’s right, then their aim was off a little bit. They should have gone for the other end of the season not this one. This one’s pitch black. A vicious alien killer, a grumpy alien doctor and human greed everywhere you look. Fang Rock’s impressive in many ways, but no-one ever accused it of being fun. 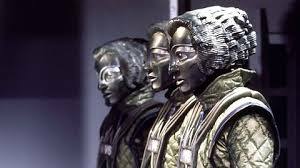 LINK to The Ark in Space: Both are Toms, and both have aliens infiltrating a group of isolated humans, killing them and adopting their form. NEXT TIME: I thought you were dead. Either you were dead, or you’d gone to Birmingham. (Tom would know how this feels). It’s a fight for Survival. It’s never mentioned very loudly, but Philip Hinchcliffe is the only producer to have been quietly moved on from Doctor Who. Not sacked, mind – you don’t get sacked for delivering the kind of ratings the first three Tom Baker seasons garnered. But if your work causes the sort of public outcry which creates headaches for BBC hierarchy, then you might be gently moved sideways. This is what happened to Hinchcliffe after the broadcast of The Deadly Assassin, with its graphic end to Part Three where the Doctor was strangled underwater. Never has a cliffhanger had such an impact; the subsequent complaints from Mary Whitehouse and her band of moral crusaders sealed the producer’s fate. But to me, the tea-time terror Hinchcliffe presided over is nowhere near as objectionable as the casual racism which peppers his last story The Talons of Weng-Chiang. Yet it’s the violence which cost Hinchcliffe his job. Seems you can offend as many Chinese people as you like, but you get those white Christians angry at your peril. Despite its racism, Talons is a towering classic of Doctor Who. It’s a paradox which speaks to how much this story is loved; we know it’s racist, but look – written by Robert Holmes! Victorian London! A murderous ventriloquist’s doll! But because of this paradox, it’s increasingly difficult to watch with any degree of comfort. I note that it has slipped down a few notches in DWM’s 50th Anniversary poll (oh yes, you know I love that thing!) and I predict that slide’s going to continue. It will always be somewhere near the top because it’s full of engaging characters, witty dialogue, suspenseful direction and the sort of flagrant budgetary extravagance you engage in when you’ve just been told to move on from your job. It’s a great story in many ways, but enjoying it involves either consciously excusing some offensive production choices or enduring a Whoish form of white man’s guilt. As is well documented elsewhere on the interwebs, Talons is racially insensitive in many ways, but it is at least the last Doctor Who story to engage in yellowface, the practice of using make up to make a Caucasian actor appear Asian. Here second tier villain Li H’sen Chang is played by the very white John Bennett (you can see just how white he is in Invasion of the Dinosaurswhere he plays a very British general), He sports heavy make up and a general Asian accent. (Even the DVD’s subtitles pick this up, talking about the conjurer’s ‘tlicks’.) Bennett, a skilled actor, does well, but it’s hard to believe there was no genuinely Asian actor who could have taken this role. Doctor Who has a track record here. 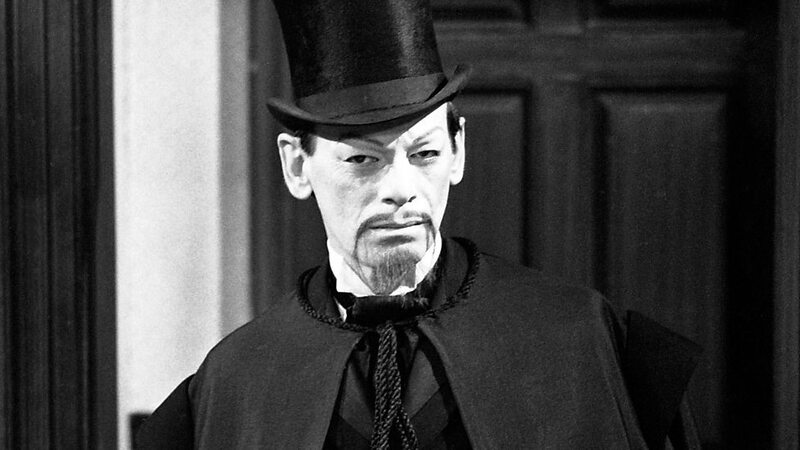 The Daleks’ Master Plan‘s bad guy was Mavic Chen, a yellowfaced Kevin Stoney. Sans accent, but with inappropriate Asian make up. And as noted before, there’s another Chang in The Wheel in Space who sounds highly suspect. Then there’s a whole cast of people in the lost Marco Polo, a story we all long to be recovered, but I wonder how we’d feel about it if we could see it. And although these are stories from the distant past, this problem still lingers. US director Cameron Crowe was recently criticized for casting Emma Stone as a half Hawaiian in his feature film Aloha. No, I haven’t seen it either. Li H’sen Chang as played by Bennett may be an unfortunately cliched character, unfortunately cast, but he has a line in self referential commentary which might suggest a critical subtext. Although he speaks in cod Chinese English (“Budding lotus of the dawn, despicable Chang has other ideas”), he has a few barbed retorts which could also convince a viewer that Holmes is making some social commentary. When the Doctor (Tom Baker, at the height of his powers) thinks he recognises Chang, the magician says “I understand we all look the same”. Later when the Doctor playfully absconds from the magician’s cabinet, he tells a knowing audience “one of us is yellow”. Could it be that Holmes is seeking to give his character some satirical bite? Well, if Chang’s too self knowing a character to offend, there are couple of other ways this story might oblige. What about its treatment of women? True, in companion Leela (Louise Jameson) we have a brave, smart and proactive female character. Just her though. The story’s other women are helpless victims and one old ghoul. And here Leela is a stand in for Pygmalion‘s Eliza Doolittle, an uncultured waif being ‘educated’ by her male seniors; hardly the most empowering of archetypes. And even though Leela is a strong, resourceful character she still ends up in her underwear, being attacked by a bug eyed monster. That’s never happened to the Doctor. Then there’s the unfortunate habit Holmes has of equating physical deformity with evil. His villain here, foe from the future Magnus Greel (Michael Spice), hides behind a mask. In Who, no-one wears a mask unless their face is terribly mangled (well, almost no-one), and so it is with Greel, whose facial contortions get their own cliffhanger. It’s the same with other Holmes creation Sharaz Jek in The Caves of Androzani, and not that different from Holmes’ hideously disfigured Master, seen just three stories before this one. So you see, Talons offers insult to all sorts of people. And even just as TV drama, it’s not without its faults. Two episodes end with attacks by the giant rat. Two others end with attacks on Leela in Litefoot’s home. Part Five features a long sequence of padding where Jago and Litefoot escape and get recaptured. Chang’s dying clue to Greel’s whereabouts is left unexplained. And the plot hangs off the villain finding a cupboard, which just happens to be in Litefoot’s house, only to forget the key and thus have to kick start the plot. I think this is going to be Talons‘ curse. Once you start falling out of love with it, you just can’t seem to stop. ADVENTURES IN SUBTITLING: Bit of a nightmare, actually. ‘Smoking pipe of poppy’ becomes ‘slugging type of toddy’. ‘Lombard St’ becomes ‘Lumber St’. ‘Time agent’ becomes ‘Time ancient’. LINK TO The Rescue. Masked villains terrorising young girls. NEXT TIME. It’s Destiny of the Daleks. So spack off! I wonder what normal people would make of The Robots of Death. You k’now normal people, not fans. We love it, natch. Loved it for years. Not gonna change. But I suspect that for a certain set of viewers, this story is the epitome of what’s rubbish about Doctor Who. It’s got people with silly names and even sillier costumes. The special effects are hokey. The Doctor’s assistant is barely dressed. The monsters have cardboard shoes. They use bike reflectors as props. Even the title is generic sci-fi tosh. And there’s one other thing which might put the not-we off; it’s about a thoroughly hateful group of people. We’re introduced to the crew of the Sand Miner in an ensemble scene early in Part One. So difficult to get right, but writer Chris Boucher nails it, telling us all we need to know about life on a Sand Miner without resorting to plodding exposition. One by one he introduces us to the cast of characters, all of whom have names like Romanian villages. Pompous, spoilt, smug, entitled types. These lot are argumentative whiners: they don’t want to take orders, they stop work to take breaks arbitrarily, they needle at each other. In that first scene, government observer Chub (Rob Edwards) taunts mover Borg (Brian Croucher). Borg is getting a massage from a robot, its cold steel fingers on his unprotected flesh, and Chub chooses this particular moment to tell a story about how a robot masseur once went berserk and ripped someone’s arm off. (“I heard it was a leg”‘ says fellow crewmember Zilda (Tania Rogers), offhandedly.) It’s a nice foreshadowing of what’s to come, as Chub is the first chump to be killed. It’s classily done. Chub stuck in a storage room, calling for a robot to help him get a package from a storage rack (spoilt, y’see. And lazy). When it comes, its eyes glow red with blood lust (a trick Russell T Davies would later borrow for the Ood). We see a distorted POV shot with Chub slowly being backed into a strangle hold. Suspenseful direction from Michael E Briant. Next up, it’s Cass’s (Tariq Yunus) turn to die (Well, apart from Kerrill, who’s dead before we can work out how annoying he was). Cass isn’t around for long, but while alive he’s ready to argue with anyone at the drop of an outlandish hat. His murder, like Kerrill’s, happens off screen. But we might feel a bit sorry for Cass because resident boofhead Borg thought it might be funny to stick a corpse marker (our murderer’s calling card and favourite bike shop spare) on his hand as a joke. Sick puppy. Next to get necked, it’s rich kid Zilda, sulky and bitchy, probably because her costume resembles that of a Fish Person from The Underwater Menace. Zilda sneaks into commander Uvanov’s (Russell Hunter) office and uncovers incriminating details about him and broadcasts them to the ship. It’s at exactly this moment that she’s murdered, a convenient plot convergence of two (as it turns out) unconnected events. It’s meant (in plot terms) to shed suspicion on Uvanov, but it’s still a contrivance. Uvanov could have escaped from Horrible Bosses. Smarmy and bullying, he’s a typical middle management type. When he finds out about Chub’s murder, he has to be forcefully persuaded to abort the mining of a lucrative storm. Then once he’s seen the body, he sets out breaking the news gently to his traumatised crew. ‘Now you all know Chub is dead. One of you killed him’ he announces. He’s winning no people management awards theree. Later he leans into Zilda’s personal space, face almost touching face, and demands to know ‘why do you hate me?’ Well, she suspects him of killing her brother, but it could just be because he’s a knob. As the end of Part Two beckons, the Sand Miner is sabotaged. Exactly why remains a mystery. Except perhaps for this; in the midst of the chaos, Borg, he of the hilarious gallows humour, is killed (again off screen) so perhaps letting the mine sink into the ground is a simple case of distraction. We don’t get to see Borg’s body, which leaves open the possibility that he might have faked his death and be the murderer. Uvanov’s another suspect, but he’s been locked up (he later escapes, off screen of course). 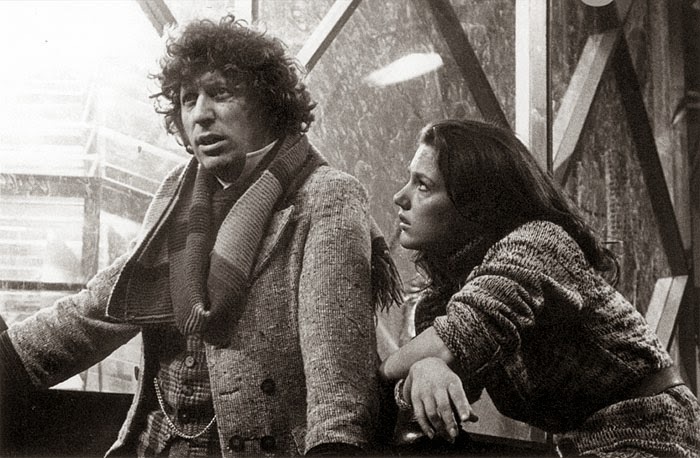 As for the saboteur though, the Doctor (Tom Baker, in a filthy mood throughout) is not fooled. ‘I’m sure Dask knows exactly where to look for the damage,’ he says subtly as Part Three opens. Dask (David Bailie) as it turns out, is our resident murderer. He grew up with robots, a kind of mechanical Romulus or Remus, and thinks he’s one of them. His plan, apparently, is to start a robot revolution, but why the first step towards this is to murder everyone onboard a mobile mine miles from civilisation is a unclear. In the final two episodes, for a want of characters left alive, it becomes clear he’s our man. But any thought Toos might be the one human to sympathise with disappears when she’s nursing a sore arm, first aid tended by Leela. She sulks an order to a waiting robot. ‘And find that girl Leela’, she says, as if summoning the hired help. ‘My arm hurts,‘ she moans. Oh that’s a shame. Why not ask Zilda or Borg how their arms feel? That leaves undercover detectives Poul (David Collings) and robot sidekick D84 (Gregory De Polnay). Poul’s the closest thing to someone to like, but he’s also the resident smart arse. He loses his mind at the sight of a blood stained robot, so he may not have been the ideal choice of investigator for this mission. He nastily tries to betray Leela to the robots while cowering under a desk (‘Help! She’s in here!’), but we’ll forgive him because, as Leela says, his mind is broken. D84, on the other hand, is sweetness itself. He stutters and makes dry jokes and tries to please. He’s got an adult’s voice and a child’s innocence. He’s too nice to make it all the way to the end, and so he gets his head blown off. And he was the nicest of the lot. The Doctor doesn’t hang around to bid the survivors farewell. Who can blame him? A couple of seasons later, the Doctor meets some more robot killers in The Androids of Tara. One of the humanoids says to him that he never feels entirely comfortable around androids. ‘Funny thing’, says the Doctor. ‘Some androids feel that way about humans’. Surely he’s thinking of the Sand Mine Suckers as he says it. LINK to Delta and the Bannermen. Hmm, two very different stories! But how about this; both are about one race of beings trying to eliminate the other, based on the fact they’re different. NEXT TIME… I don’t like your face. Nor your hair! What’s that in the sky? It’s The Tenth Planet.